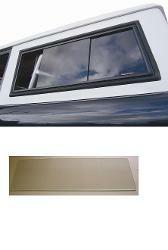 New 66-77 Ford Bronco Hard Top Quarter Panel Slider Window Kit with Matching Tinted Liftgate Glass. This kit offers a great upgrade for back seat passengers. The slider windows allow passengers in the back to open the rear window and let some air in on a hot day. The tinted glass on this window kit not only looks good, but also provides extra protection from the blazing sun. This kit is a must for anyone running a 1966 to 1977 Bronco with a hard top who plans on having children or animals riding in the backseat on a regular basis.